The primary goal in preseason games is to evaluate talent not to necessarily win. That being said it is nice to win and the Eagles did just that. I’m going to focus mostly on individual player performance. The eagles first team offense and defense both played well. I’m pretty comfortable going into the season so far, but want to see them continue their success for the remaining three preseason games. I want to see more out of Brandon Graham, Daniel Te’o-Nesheim, and Jamar Chaney. I’m really looking forward to game two to see what they’ve got. Martell Mallett looked good and might have played himself into a roster spot, rushing for 60 yards and a TD on fifteen attempts and hauling in 3 catches for 18 yards. The eagles still really like Eldra Buckley though and I’m not sure if they are going to keep four running backs. Charles Scott blocked well at fullback, but I think that he is going to be cut. I don’t see the Eagles keeping two fullbacks and Weaver is clearly the starter. Chad Hall ran, caught and returned the ball well in his first game. He rushed for 22 yards on two carries, got 60 yards on two catches , returned three kicks for a 21 yard average and two punts for a 7 yard average. I would like to see him increase his return averages, but otherwise I was impressed. I think that the eagles will consider keeping him because of his versatility, but he is still locked in a battle for the 5th or 6th receiver spots. I was impressed by Keenan Clayton the undersized linebacker. He finished with 4 tackles and a sack. I’m really interested to see how the linebacker position shakes out. This is one of those positions that is going to take a lot of study to figure out. 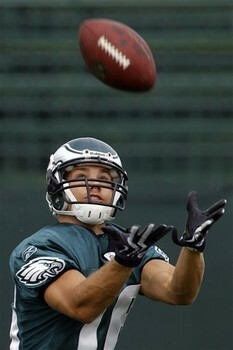 Riley Cooper looked good once again and caught 3 balls for 61 yards. He already secured himself a roster spot. He is now working on increasing his potential playing time. Vick seems to be back in football shape and played very well finishing 11/17 for 119 yards, along with 50 yards rushing and a TD on 6 attempts. He did however throw an interception and fumble the ball. Kolb is firmly entrenched as the number one QB. LeSean McCoy had an alright game but I would like to see him break some runs. He ran and received the ball fairly well. I’m waiting to see some more of the old Westbrook in him. So far I’m not entirely sold on him. Kolb finished the game 6/11 for 95 yards. He threw accurately and with enough power. I’m confidant in Kolb, but want to see him keep up the good work in the remaining three preseason games. I wasn’t very impressed with Joselio Hanson as he got beat deep and hope that neither of our top two cornerbacks get hurt this season. I’m uncomfortable with our depth at this point. Posted in: General, Philadelphia Eagles. Great post bro, was a good game. I dvr’ed it and have watched it a couple of times. I agree that Graham looked well DTN looked FAST out there but I still want to see a lot more from him. Lindley impressed me as well as Coleman. I feel those two will be fighting for good playing time at their respected positions. I would not be surprised to see Coleman beat out Demps and Lindley to beat out Hanson. Another question is the WR position. Will the Eagles really consider taking 6 WRS? We have 4 set in for sure those being – Jackson/Maclin/Avant/Cooper so if we take 5 its a battle between Hall/Washington/Baskett . Hall needs to show me more although he is so versatile and useful to the eagles at RB/WR/KR-PR. Should be a nice battle. The one that I am really looking forward to personally is the DT position. With Bunkley at RT and Patterson at LT I would like to see who wins the backup jobs. My guess is for some reason we take 5 into this and Owens or Robinson may be the odd man out because of how well former 2nd round pick Laws has FINALLY been doing. Should be interesting in the coming weeks. FOOOOOOOOOOTBALL is starting soon. SO PUMPED! I tend to think that they will keep 4 DTs because they keep saying that T’eo and Graham can play DT also. At the same time Owens played pretty well in preseason. I think that this point Laws is a given and Dixon is probably the 4th again. I agree that Lindley could push Hanson. It’s going to be really fun to watch this second game. I can’t wait!